Could This be the End of the High Cotton Prices? Last year, in June, we asked whether the cotton price recovery continue? The answer was yes, it did, all throughout 2016 and into 2017. But now the real question we need to ask ourselves is how much longer will the price continue to rise? To answer that question, we must understand why prices rose to almost three-year highs in the first place. First, increased demand. The U.S. is the largest exporter of cotton, accounting for 29% of global exports. Exports for 2016/17 have been forecast to increase 53% year-over-year. This is mainly driven by higher demand from Taiwan and China. As a result, the U.S. share of global cotton exports is set to reach 39%, the highest level seen in 6 years, from 26% in 2015/16. This is despite U.S. production up 34% y-o-y this season. Second, Chinese supply. 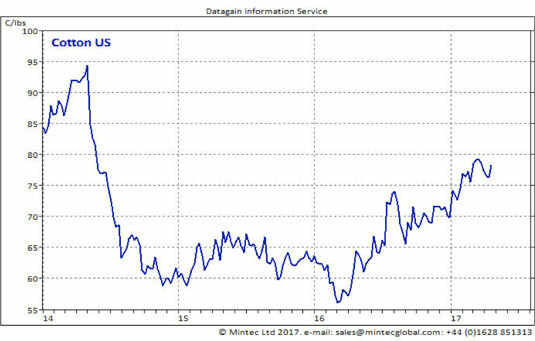 Prices shot up in July after Chinese cotton stocks were forecast to fall by 1.9 million tonnes y-o-y to 11.3 million tonnes for 2016/17, raising concerns over low supply. These speculations caused panic buying in the market, which saw prices rise. In fact, Chinese cotton stocks have been revised down further, currently forecast at 10.7 million tonnes, down 15% y-o-y. Third, Global stocks. This is the second consecutive year that global ending stocks have fallen. Ending stocks are forecast down 6% y-o-y for the current 2016/17 season, and down 19% since the 2014/15 season. This is mainly driven by reduced ending stocks in China, as well as global consumption outweighing production. These three factors together have seen cotton prices in the U.S. shoot up in the past year. Now we turn back to our original question: Will the cotton price recovery continue? Well, reports for the upcoming 2017/18 season show that U.S. cotton planted area is expected to rise by over 20% y-o-y. As long as the weather remains favourable, production would be expected to rise. After this was announced, prices fell 1% in one week but have since risen, albeit to not to the peak in March. This could see a downward trend to cotton prices in the near future, as the new season kicks off in a few months. Will Cotton Price Recovery Continue? You forgot to mention India.India’s crop was 20% lower than initial estimates resulting in the mills frantically looking out for cotton in the 2nd half of the season.It was Indian demand that hugely supported the rise in NY futures.